Imaginarium Art takes on Erick Sosa!! Imaginarium Art have been making an appearance a lot lately on social media firstly with their epic Aquaman on throne piece. Which totally blew us at Radd Titan away when we reviewed this in person. Then more recently at the STGCC 2015 with there huge and amazing Hulkbuster from the Avengers:Age of Ultron movie. Imaginarium Art do not play games when it come to the size of their pieces. Aquaman (Length 58cm x Width 55cm x Height 96cm With Trident) or Hulkbuster (Length 75cm x Width 65cm x Height 80cm). 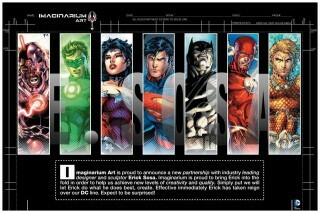 So it is no surprise to us that Imaginarium Art have announced their 1/3 DC line. Not only do fans get this great new, but to top it of IA are working with Erick Sosa on these pieces. We are really excited to see what the team with come up with their future designs on this piece. “Imaginarium Art is proud to announce a new partnership with industry leading designer and sculptor Erick Sosa. Imaginarium is proud to bring Erick into the fold in order to help Imagiarium Art to achieve new levels of creativity and quality. Simply put Imaginarium Art will let Erick do what he does best, create. This is huge news for any collector of DC and we can not wait to see the work that the team achieve together. If it is of the same standard of their Aquaman fan have a lot to be looking forward too.